If I wanted to visit one museum in Amsterdam, this was the museum. I've researched it a long time before our trip to Holland and I knew that when the occasion came I will visit it. Don't get me wrong, this was my fifth or even sixth trip to Amsterdam so at this point I've visited all the major museums, starting with Van Gogh, but I have to say that I like this small museums better. And on top of that they are very easy to find since most of them are on Herengracht street. The national or folk costumes of Romania are one of my passions, I collect them, I wear them and I am proud of having them, so I try to find or to visit other ethnographic museums or even costume museums everywhere I go. I wrote about them on my blog, but some posts are in Romanian, The Ethnographic museum in my hometown, Iasi, Village museum in Bucharest, The Ethnographic Museum in Krakow, Poland, The Ethnographic Museum in Warsaw, Poland, The Ethnographic Museum in Split, Croatia, The Ethnographic Museum in Ljubljana, Slovenia, and Roscheider Hof Konz, an ethnographic/village museum in Germany. I know I've visited more, there is one even in Luxembourg, but it probably didn't make it to the blog. 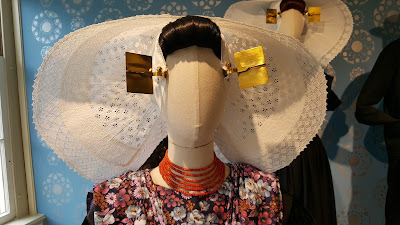 Going back to our topic, the Costume museum in Amsterdam is a small museum, only 7 rooms, on three levels. Be careful though, the staircases are so steep, that I almost fell at least one time. As I understood, the museum started when three or four costume collectors teamed up and decided to show their collections to the public. The house of the museum was donated and as I said it is in a central location in Amsterdam. The ticket is 10 euro and during the summer season the opening hours are from 10 a.m. to 6 p.m..
What I liked at the museum was, besides the collection, the photo booth where you can dress in those costumes and take a picture. You can do that without visiting the museum, so next time that is on my bucket list :) This time my husband was visiting another museum as he is more into technical stuff and taking a picture by myself was no fun. But if you are interested, a single picture is 15 euro and a family picture is 35 euro, for two adults and two children. 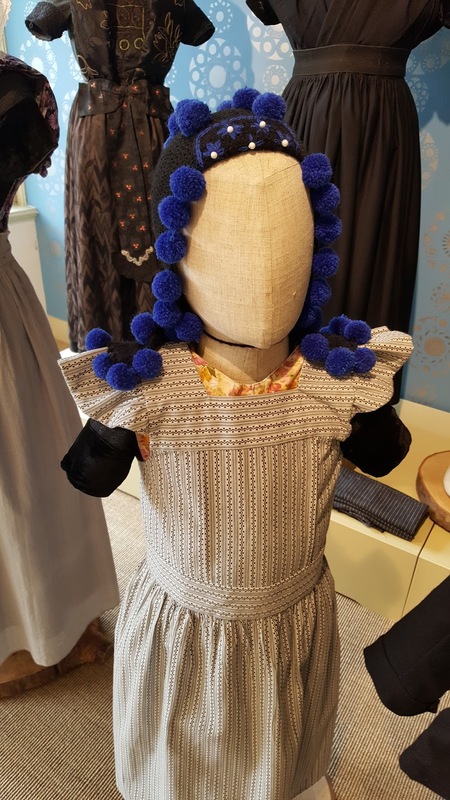 When I visited the museum, I found a woman who was doing her PhD in folk costumes of Holland and we visited the museum together. It was such a pleasure, that I didn't need the audio guide or any other form of guidance, as she told me a lot of stories and helped me to place the costumes and explained some elements that did not make sense to me. I even visited the bathroom, because on the website it said that it still has the Delft ceramic toilet. The seven rooms of the museum represent seven regions and one could find the stories that go with the costumes displayed. I like that, because all Romanian blouses have stories to tell and I found a connection between them and the Dutch costumes. Different from the Romanian costumes though, the Dutch ones always have something to cover the head and also I found a lot of printed or painted fabrics as opposed to embroidered ones in Romania. Overall it is nice to notice how the history and trade influenced the costumes, how they still have some practical parts (they are large to be comfortable when riding a bike) and how some communities still maintain the habit of wearing the costumes. So if you are passionate about costumes, as I am, I definitely recommend you to visit this museum. Here are some pictures. These were not installed by jealous husbands as I initially thought. They actually go close to the forehead, similar to the ones in the cover picture of the museum's fb. page. This is from some sort of material that we put on tables, some sort of rubberised fabric. Similar to the Romanian costumes, I've noticed that they pay a little more importance to the top part of the costume, the bottom is sometimes black and undercoated. They also have some aprons in front, similar to Romanians, it's just that in the case of the Dutch costumes they seemed to me to be more functional, as opposed to Romanian ones which are more decorative. Also the length of the apron is different, the Dutch ones are larger going almost fully around the women's body, the Romanian ones are just pieces of cloth in front and sometimes in the back of a woman. The same as with Romanian costumes, the richer and influential the person was, the more decorated the costume. It was a pity that I visited the museum on our last day in Nederlands and I didn't had enough time to grasp everything. I will surely go back to the museum. If you liked this article or if you are interested in folk costumes, drop me a line on my Facebook page is Dichisuri.ro.